The Shadow of What Was Lost: The Licanius Trilogy, #1 (2016. 693 pages) is the first part of a new fantasy series, written by first time novelist, James Islington. 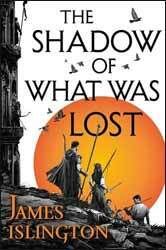 The book is a fairly straight forward fantasy novel, in that it does what it sets out to do well, but adds little which has not been seen before; if anything its influences are occasionally barely hidden. Our main protagonist is straight out of Joseph Campbell 101. Davian is a young man, who suspects that he may possess greater power than he should. Immediately you read this you know he is going to meet a wise old man/wizard and be sent on a journey. He will overcome many trials and peril to finally blossom a man of great destiny and power. With little in the way of surprise, Davian is approached the night before his trials, given a magic talisman and told to travel north. Although he intends to go alone, his faithful friend Sam, nope wrong book (here it is Wirr) refuses to let him go alone and the two set off. No sooner have they embarked on the journey than we see them stop at an inn when, blow me down if they don’t accidentally expose the Vessel, leading them into further danger. They should have gone to the Prancing Pony and just pointed at the Hobbits for distraction. Joking aside you could not accuse the author of overt plagiarism, like most first books it’s more homage to all of the author's influence. Outside of that, Islington is able to start to construct his own world, one where the use of magic is either heavily restricted or banned altogether. The book's initial quest, for quest there must be, is given to Davian under an odd and potentially false premise. He is visited by a man he has only recently met, who is supposed to be officiating at his trials, a test to see if you are one of the gifted; he is given a talisman which he is told will lead him north to be trained as a possible Augur, a very powerful magic wielder and he believes the whole story, which does not bode well for his chances at surviving in the open world. Of the three main characters Wirr was ok, if a little too convenient sometimes when there is trouble, a sort of faux medieval sonic screwdriver. Davian is the everybody of the book and I suspect that it is this character that we should have been rooting for, but I found Davian’s other friend Asha far more interesting. Books like this have to have a big bad and a reason for the quest. In this case there is a magic barrier far to the north which, prior to their demise, had been erected by the Augurs to hold back an invading army. Now the Augurs are no more it falls to proto Auger Davian to see if he can save the day. So, as it goes this was a well written, if overlong book. Not bad for a first novel, but hopefully Islington will start to create and expand upon the people and world to make it distinctly his own.